The Best DIY Youtube Channels selected from thousands of channels on youtube and ranked based on youtube channel subscribers and popularity. Data will be refreshed once a week. 1.59 Dhwani Bhatt - "Why buy it when you can DIY it"
1.99 DIY Tutorials - How to make new again! About Youtuber I'm Lauren, your DIY-obsessed bestie that is all about creativity, glitter & petting dogs. About Youtuber I love sharing DIY videos, reviews, and a little bit of makeup tutorials here and there! I'm goofy and very comfortable in front of the camera. I love engaging with you guys! Thank you for being with me in this super fun journey! About Youtuber This channel is the ultimate guide for DIY projects, pranks, hacks and how-tos. He picks up all the unused scrap items from his house, and turns them into something meaningful. About Youtuber At HouseholdHacker, we solve your common everyday problems and create things utilizing items you find around your house. You might say we try to bring out the MacGyver in all of us. From kitchen hacks and tricks to getting rid of ants; we do it all. About Youtuber The I Like To Make Stuff channel is an extension to his blog, and houses a collection of videos that teach you how to make funky signs, an outdoor kitchen sink, and even a pudding gun. He hosts a show called maker 101 that teaches the basics of different tools from saws to even Arduino micro controllers. His videos will seriously give you some engineering 101 lessons, and inspire you to make them. About Youtuber I love making DIY videos, also DIY Gifts, Hacks, Organization, DIY Room Decor, Tumblr and Pinterest Inspired, Beauty and Lifestyle related videos! Diy Schools Supplies and Back to School Supplies Hauls videos! Videos for Halloween Costumes Treats and Decor also Christmas Gifts and Decorations. About Youtuber I'm Joanna Zhou, a professional illustrator/designer based in Austria. Maqaroon & Cute Life Hacks is a place where girls can get creative inspiration, DIY ideas and good life advice without the glorification of money, beauty or body image. About Youtuber Easy DIY "how to" video tutorials. DIY accessories, cosmetics, life hacks, pranks, home decor and many else. Make it easy! About Youtuber This YouTube channel is aimed for users who want to learn some serious building techniques. Ramsay's aim is to make woodworking, carpentry and steel-bending a household hobby. About Youtuber This is the people's automotive channel! Learn how to fix your car and how it works. I've been an auto mechanic for the past 50 years and I'm here to share my knowledge with you. About Youtuber On my channel: Hacks, DIYS, Simple/Everyday Makeup Tutorials and Tips, Morning and Night Time Routines & Fun Tags, Hauls & Favourites, Hair Tutorials, Diet & fitness Tips, Look books & Fashion Videos, Skincare! My name Is Nichole! Im so glad to have you on my channel! Im from michigan and I am going to school for multimedia journalism. About Youtuber Type of videos I make: Furniture and home decor, Woodworking and shop projects, Limited tools (for woodworking beginners), Concrete. About Youtuber Quick and easy DIY tutorials. About Youtuber My name's Nastazsa and I'm a California Native. Here on this channel I will be sharing with you my interior design tips, fun DIY videos and even some of my fashion favorites and outfits. Subscribe if you want to enjoy a glimpse into my California lifestyle. About Youtuber This Old House expert advice on home improvement, remodeling, upgrades, tools, and products. Build Your Dream. Do It Right. America's most trusted home improvement brand. About Youtuber Rulof Maker celebrates his love for DIY through a YouTube channel that is worth subscribing to. His videos are a must watch as they teach you how to make a underwater breathing device and even make a coffee machine out of light bulbs. About Youtuber Here you will find everything from money saving tips, woodworking projects, jigs and completely wild contraptions. I have been building and designing since I was old enough to swing a hammer. With a mind for out of the box thinking and an unusual mix of artfull design and engineering interest, you never know whats going to happen next. About Youtuber Each Wednesday (several extra days), we will see together how to create fun objects, ranging from scrapbooking to pasteable molds to home decoration. Every video explains step by step how to make your own, even for various occasions such as parties, weddings, birthdays, and so on. Also providing various templates and templates to facilitate your work. So what do you expect? About Youtuber In my channel you will find: So much creativity, many creative DIYs and everything that goes through my head to experience, remember a handmade thing though imprecise is always done with your heart! About Youtuber This channel is run by a Mumbaikar, and is dedicated to his love for DIY. His channel contains videos aboutroom decor ideas inspired by nature and Pokemon to gift ideas and even DIY plant holders. He makes everything from scratch, and is worth a follow. About Youtuber I produce how-to DIY home improvement videos to help people of all skill levels. I've been a professional in the construction industry for decades and share my knowledge with you to empower DIYers. About Youtuber Hi, my name is Elizabeth! I am 20 years old 🙂 Welcome to my channel for creating doll miniatures from simple materials! About Youtuber This channel is dedicated to helping homeowners learn the skills and tricks of the trade so that you can renovate anything and get professional results. My name is Jeff and I want to help you to get the home of your dreams and do it yourself. Learn all the trade skills you will need and grow value in your life's most important asset. You can do it and we are here to help! About Youtuber I love to make videos thats my hobby and it just makes me happy. I would love to hear what you have to say so don't be shy to comment and I will make sure to respond. I will be posting videos on DIY's, Skits, and more. About Youtuber DIY Tutorials That Will Make Your Life Better, Simple Life Hacks. About Youtuber Easy DIY Miniatures is a video blog dedicated to miniatures. Here you will find miniature creations, tutorials and much more. Learn how to make toy miniature, kitchen miniature, miniature dollhouse & miniature household items. About Youtuber Learn DIY (Do It Yourself) tutorials of amazing art and crafts, home remedies and cooking with us. Our easy to learn videos and simple presentation manner makes it superbly easy for you to understand the creative process. About Youtuber DIY ideas for home decor, jewelry,Organization and Wall Art. About Youtuber Money-saving hacks and DIYs for upgrading your home and life that will have you saying, "Why didn't I think of that?" About Youtuber The Official channel with the best compilations of MAKEUP, HAIR, NAILS & DIY tutorials. About Youtuber This Channel Is About Homemade Product Or Diy Projects , I simply Showing Anything How To Make Anything Form Waste, And Also I Am Showing This Detail For Better Understanding. so if you a creative person this channel is made for you. About Youtuber I make fashion & beauty videos, makeup & hair tutorials, travel vlogs, DIY's and lots of other fun videos every monday & friday! About Youtuber Hong Giang DIY Slime is the best YouTube Slime channel for diy slime. It's the home of Giant Toothpaste Slime , Giant Fluffy Slime, and Giant Floam Slime. I love Slime! About Youtuber I love braaing, dinner parties and DIY. I also love to go out for a koffie with my best friend Marianne. Produced by Sketchbook Studios. About Youtuber It's me Larissa D'Sa (pronounced as Dee-sa) I live in Mumbai, India and I make DIY, Art, Fashion & Beauty related videos! About Youtuber DIY Network is the go-to destination for rip-up, knock-out home improvement television. DIY's programs and experts answer the most sought-after questions and offer creative projects for do-it-yourself enthusiasts. One of the fastest growing digital networks and approaching 50 million homes. DIY's award-winning Web site, www.DIYnetwork.com, is a leader in the Nielsen//NetRatings' Home. About Youtuber I love to make new things and want to share it with you. About Youtuber Our Channel Include of Guiding Video : Home Made Things, Life Hacks, DIY Projects, Origami, Mobile Solutions and many more. About Youtuber DIY Mommy bringing teaching you how to make everyday items look like a million bucks! Also, chat with me about life as a new mommy, military wife life and all the products I love. About Youtuber Do it yourself makeup tutorials. About Youtuber This channel is all about DIY paper showpiece. About Youtuber I am Sonali and my channel will give you easy and interesting Indian DIY craft that you can try yourself at home. DIY crafts and much more creative stuff which you can learn by watching my videos. About Youtuber I created this channel as an outlet to share my creative crafting mindset and to help all those who share their artistic desire to create but don't know where to start. I hope to inspire, teach and most of all create friendships with those creative's that reach out with open mind and heart. My name is ReinaMoe's and I welcome you to keep watching as I create wonderful art in my own way. About Youtuber I'll share original content created by myself, including DIY projects, wedding decor, home decor, event design, floral design and any celebratory event! I'm just an artist at heart that loves creating and I want to help others in everything that I do! I also will be incorporating inspirational videos, vlogs, challenges, personal motivation and love talks! 59. Dhwani Bhatt - "Why buy it when you can DIY it"
About Youtuber I'm Dhwani and I'm from Mumbai, India. I make DIY projects, Room Decor, Affordable Fashion Hauls and Lifestyle videos. I'm here to inspire, teach and learn. About Youtuber Julia DIY beauty and easy. About Youtuber Right now, you will see home decor "do-it-yourself" (DIY) projects that you can easily follow step by step to create interesting pieces that look high-end. About Youtuber The 360° handmade channel! Every Wednesday, we'll create items, ranging from decoupage, the polymer clay to the home decor. Simply but as thoroughly as possible, each video explains step by step how to make your works. So what are you waiting? Join us for the news every week! About Youtuber DIY or DIE is a vaping channel mainly focusing on all aspects of DIY. From mixing your own ejuice to building your own box mods and coils, DIYorDIE is going to be your last stop for all your vaping needs. Stay tuned to also get great recipes by me and some of the top players in the game, flavoring notes, taste testings, and product reviews! About Youtuber Here you can find inspiration and ideas on topics like loom bands, friendship bracelets, home decor, organization, fashion, diy jewelry, storage, art, handmade stuff, crafting, how-to tutorials and much more! About Youtuber My name is Lissa and Welcome to a little bit of everything: from HOW TO videos to DIYS to decorating and organizing to product reviews. Here you can watch me CREATE NEW and RECREATE INSPIRED LOOKS for LESS. About Youtuber This channel is about DIY projects, ideas, renovations etc. I'm doing many things and sometimes I have camera with me. As You will notice, sometimes my son makes the projects with me, because it is also our common hobby to make something toghether. Here You can find some woodworking, some toys, games for children. some metalworks, knives, room, garden and home decorations and other DIY stuff. About Youtuber This channel is all about DIY things. Great ideas for gifts , home decoration, holiday decoration, Christmas ornaments, greeting cards, fashion jewelry, gift boxes and envelopes, personalized origami gifts, flowers with a secret message , origami for mums and other awesome ideas. About Youtuber I am a thrifty DIYer who enjoys making things beautiful. About Youtuber I'm Elena (also known as DIY's by Elena here on Youtube) In this channel you will find many things, but mostly lifestyle, fashion, beauty and diy videos! If you love the above, you are sure to fit in the diysbyelena family! About Youtuber On my channel, you'll find lots of tutorials for learning to knit on a round loom and inspire you for realize beautiful works. I invite you to subscribe and knit with me ! About Youtuber Welcome to my channel,Welcome to my world of art and craft. Art and craft is my hobby, In this channel i am trying to show simple ways of creativity. You can expect anything and everything about art in my channel. About Youtuber This channel is for you want to or looking for ideas for decorating anything what you want or do it yourself. About Youtuber Here you will find videos on planning, DIYs, Pocket Letters and so much more. I love shopping at Canadian Dollar Tree and Dollarama, I look forward to sharing my hauls with you. About Youtuber I am the mila, I am 23 years old and live in Switzerland. Here you will find DIY & Beauty videos. About Youtuber Whether you are a fresh classic mini owner or a seasoned vet this Classic Mini channel is a great place to learn how to perform simple and sometimes more complex tasks on your car. In addition we are partnered with Launching Balloons(launchingballoons.com) to bring you all of their Balloon launch videos! About Youtuber I'm Barbara I'm 33 and I live in Italy! I love DIY in all applications, in Beauty, Home, Fashion and Style!! I'll let you see and teach all I know and all techniques I use! About Youtuber Hi, my name is Dayana. I'm so happy to sharing my videos with you, I love to make Unboxing, Human Body, Science and DIY. About Youtuber This channel provides videos which consists various DIY tips and tricks. About Youtuber Craftasm is a channel of my passion. I love making crafts with paper and other wasted things from daily life. No craft is hard to make. It is all about easy DIY. I am sharing my love for making crafts by own. I hope you enjoy it as much I do. About Youtuber My name is Alessia De Bonis, I'm 28 and I live in a picturesque country in Basilicata. I've created this channel to get you into my creative garden: you will find decorating agendas, tutorials for seasonal handmade designs, cake design and home decor. About Youtuber Hello Everyone, on my channel you will find lots of creative DIY, Tips, Paper Crafts, Handmade Cards, Origami, Room Decor, Doodles other Art And Crafts. I am not a pro but will tell you what i know. Please feel free to Share your ideas and suggestion. If i use your idea i will mention your name. Be Creative Now! About Youtuber If you love crafts, DIYs, fashion, style, etc. as much as I do, then you have come to right place! About Youtuber I'm Matt, and here on DIY Perks you'll find plenty of interesting DIY projects on a variety of topics, including computers, woodworking, electronics, audio, and more! About Youtuber DIY Corner is a place where you can find DIY beauty tips, diy hair care, skin care, diy crafts, diy home decor ideas. About Youtuber My name is Iwy and I'm 15 years old. I love to film and edit and i have a passion for DIY! About Youtuber As the name suggests, this channel teaches you to build tech-related things. However, the most interesting bit is that it is run by a 17-year-old Filipino boy who loves to tinker with electronics. Some of his accomplishments include building a mini-robot, a fitness band, and a Bluetooth speaker. About Youtuber DIY Stuffs. LIFE HACKS YOU NEED TO TRY. About Youtuber Learn How to maintain home and garden by DIY tutorials. About Youtuber I'm Momo from California. Join me for weekly sewing tutorials and occasional fashion videos. I hope you stay a while and find some inspiration here. About Youtuber Since the Summer of 2008 when I was 13, I have made DIY tutorials for movie props. Today, I am 19 years old and currently operate a video production company called PMFilms. After making more tutorials during the Summer of 2013, I will be attending Pratt Institute in Brooklyn New York and majoring in film. Please enjoy my channel! 99. DIY Tutorials - How to make new again! About Youtuber DIY Life Hacks. About Youtuber I own a computer repair shop in Naples, FL and we do quite a bit of repair on laptops and PCs. I enjoy the hardware refurbishing and creating how to videos. About Youtuber Here you can find cool and easy crafts, back to school ideas, diy phone cases, custom clothes, DIY bracelets, room decoration ideas, cooking and fun recipes, fashion and makeup tutorials and other awesome ideas. http://www.facebook.com/hoynohaycoleEasy and simple to follow, step by step videos, perfect for beginners and kids, affordable and achievable at home. About Youtuber DaNi B. Jade here! I am from the United States, and I love anything that is DIY related. I love Home Decor, Room decor ideas, Dollar Tree DIY, and DIY projects. I thrive with anything that is DIY related, but also Vegan meals, What I Eat in A Day, Fashion and more! About Youtuber Guides and ideas for DIY toys, Homemade toys, simple handmade toys for kid and adult also. 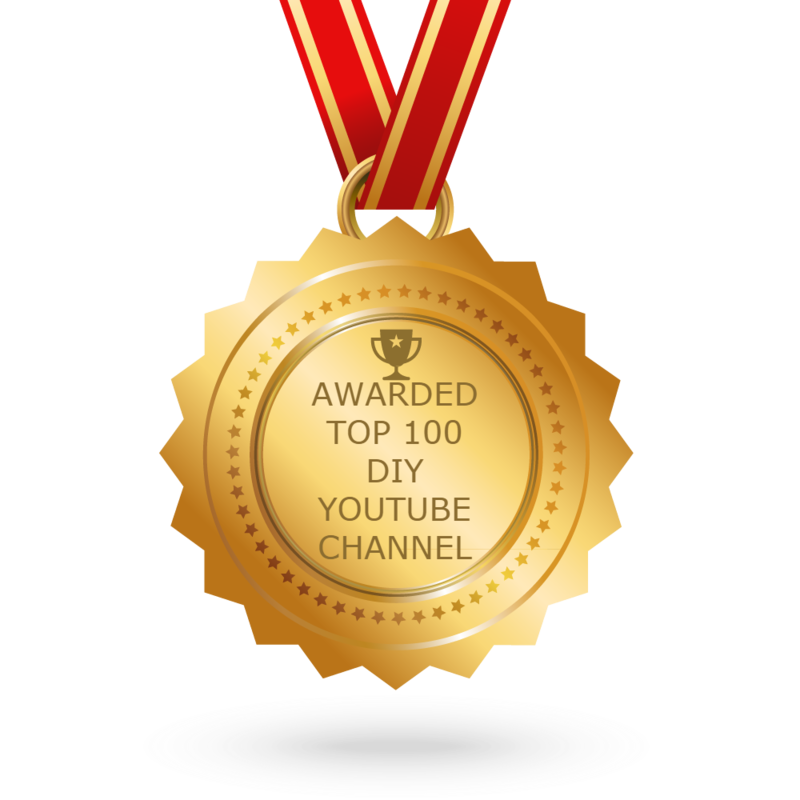 CONGRATULATIONS to every user that has made this Top DIY Youtube Channels list! This is the most comprehensive list of best DIY Youtube Channels on the internet and I’m honoured to have you as part of this! I personally give you a high-five and want to thank you for your contribution to this world.